This page covers advantages and disadvantages of GEO Orbit. It mentions GEO Orbit advantages and GEO Orbit disadvantages. GEO stands for Geosynchronous or Geostationary Earth Orbit. There are three main types of orbits viz. LEO, MEO and GEO based on distances from lowest to the highest from the Earth. There are orbits around the earth where satellites are installed after their launch. Following are the features of GEO orbit. 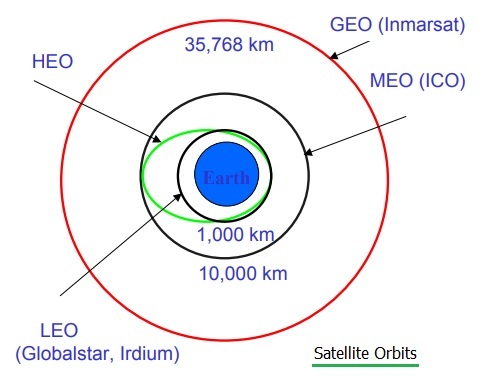 The figure-1 depicts GEO (Geosynchronous or Geostationary Earth Orbit). Refer basic difference between geosynchronous and geostationary orbit types. ➨As it is at greater height, it covers larger geographical area. Hence only 3 satellites are required to cover the entire Earth. ➨Satellites are visible for 24 hours continuously from single fixed location on the Earth. ➨It is ideal for broadcasting and multi-point distribution applications. ➨Ground station tracking is not required as it is continuously visible from earth all the time from fixed location. ➨Inter-satellite handoff is not needed. ➨Less number of satellites are needed to cover the entire earth. Total three satellites are sufficient for the job. ➨Almost there is no doppler shift and hence less complex receivers can be used for the satellite communication. ➨The signal requires considerable time to travel from Earth to satellite and vice versa. The signal travel delay is about 120ms in one direction. The distance of 35786 Km gives 120 ms latency with 3x108 m/sec speed of the signal. Hence it is not suitable for point to point applications requiring time critical applications such as real time voice, video etc. ➨Since GEO orbit is located above the equator, it is difficult to broadcast near the polar region. ➨Due to longer transmission distance, the received signal is very weak. This requires better LNA (Low Noise Amplifier) and also advanced signal processing algorithms in the satellite modem. This increases cost of the ground station equipments. ➨It provides poor coverage at higher latitude places usually greater than 77 degrees. Also refer advantages and disadvantages of LEO >> and MEO >>.